You will discover Paris during an audio- guided city tour. You will then discover the charm of Paris on the Seine river while savoring a delicious meal aboard a comfortable boat-restaurant of La Marina. You will go at our PARISCityVISION agency where the departure will take place at 10 a.m starting with a city tour on a panoramic bus. Admire the bridges, squares, streets and famous districts of the city : the Place Vendôme and its famous jewelers, the Opera House, the great Louvre museum, the magnificent Notre Dame cathedral, the Pantheon, the musée d'Orsay that houses so many impressionist paintings, the Place de la Concorde, the incredible Champs-Elysées avenue where the Arc de Triomphe dominates, the singular Eiffel tower and the Invalides. Thanks to the Paris city tour aboard a panoramic bus, you will learn about Parisians' customs. All along the tour, the audio-guided commentaries will tell you about the history of Paris and its architecture through time. You will find your bearings in Paris with this 2-hour tour through the main neighborhoods of Paris. You will get to see its most famous monuments such as the Eiffel Tower, Note-Dame de Paris, the Opéra Garnier and the Louvre. Your children will enjoy this two-hour Paris city tour to discover the City fo Lights in their own way. Thanks to audio-guided commentaries, Lulu and Maurice the dogs will tell them fun anecdotes about the dogs of famous figures such as Napoleon and Marie Antoinette. They will discover that Paris loves dogs and welcomes them everywhere. Audio guides are available in: English, French, Spanish, Italian, German, Portuguese, Japanese, Mandarin Chinese, Korean, Russian. Audio guides for children are available in: English, French, Spanish. 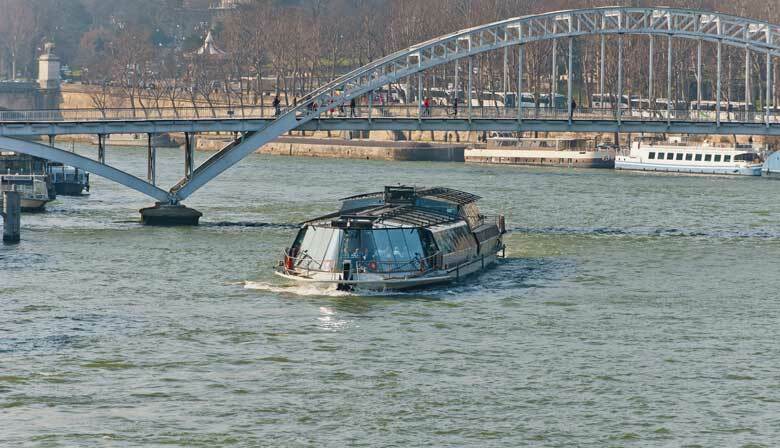 After about an hour and 45 minutes on the city tour, you will arrive at the quay de La Bourdonnais facing the Eiffel Tower, and climb aboard on of the Bateaux Parisiens for a lunch cruise. Enjoy french gastronomic cuisine in a musical and warm atmosphere. Take this opportunity to see the exceptionnal view of the monuments along the Seine river through the the large windows on the boat. The tour ends at the quay de La Bourdonnais. Lunch-cruise with the menu "étoile"